This article was written about for people who are trying to get W-2 only mortgage loan in California. The state of California is located in the Pacific Region of the U.S. Its terrain includes redwood forest, cliff-lined beaches, the Sierra Nevada Mountains and the Mojave Desert. California is famously known as the Golden State and is home to some of the best places to work including Intel, Scripps Health, and Google. Some of the great cities to live in California include San Francisco, San Jose, Santa Barbara, Victorville, Irvine, Palo Alto and Berkeley. Homes prices in California have been increasing in the last five years and the California Association of Realtors forecast that the home prices will increase by 4.2 percent in 2018. If the forecast turns out to be right, the price of single-family homes in California will exceed $560,270. The gains in home prices are, however, lower than the last few years, which signal that the rate of acceleration of California’s real estate market has slowed down. For self-employed borrowers who are 1099 wage earners or business owners, getting a mortgage for a new home in California can be hard. The reason is that they tend to write off expenses on their tax return due to which their returns don’t show their actual income. Self-employed borrowers must provide mortgage lenders with tax returns of 2 years to determine the expenses that have been written off by them in their tax returns. But, it will be their income that would qualify them for a mortgage. For W2 income only mortgage, adjusted gross income (AGI) is calculated by mortgage underwriters after all deductions. An average of 2 years is taken from the AGI. However, the average of 24 months is only averaged if the AGI is either same or more in the most recent year. In case the AGI is lower in the most recent year, then the mortgage underwriter will use the income of the lower year. If income is found to be declining and chances are that it will continue to decline, then you won’t be able to use this income to qualify for a home loan in California. 1099 wage earners who want to qualify for a mortgage, must provide two year 1099’s and tax returns. In this case, tax returns are necessary to see the amount that been written off by the borrower. Then the mortgage underwriters will use the adjusted gross income to calculate income. W2 wage earners will need to provide their most recent paycheck stubs of the last 30 days. They are also required to provide W-2s of two years, but there’s leniency in this regard. For example, if a W2 mortgage applicant has been working for a certain company as a part-time employee for the last two years, but later got promoted to full-time employee, then income at full-time status will be used to qualify for the W-2 only mortgage loan in California. If an applicant got a promotion with an increase in pay, then the mortgage underwriters will use the new pay for calculating the income. If a loan applicant switched jobs and was offered a higher pay in the new job, then the pay of the new job will be used to calculate income, making it easier for them to qualify for the mortgage. If a W2 mortgage applicant has been unemployed, they can still qualify for a home loan provided they found a job within 6 months and the employment gap was not more than six months. In case, a mortgage applicant remain unemployed for more than six months, they will have to work for six months in the new job before they can qualify for W2 income only mortgage with their new job’s pay. W2 wage earner mortgage applicants can qualify for W2 income only loan on FHA loans, Conventional loans, and VA home loans. 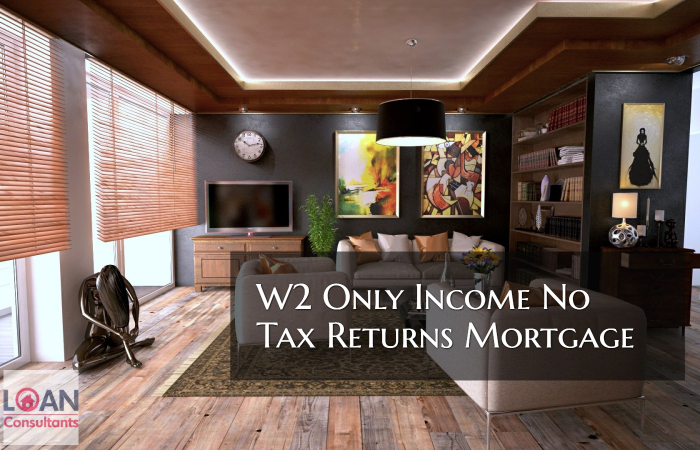 Since W2 wage earner borrowers are not required to provide income tax returns, therefore, W2 income only no tax return mortgage is ideal for W2 wage earners. If you’re a W2 wage earner, then use the income only no tax return mortgage to qualify for a W-2 only mortgage loan in California. If you have been denied a home loan or have any questions about real estate or mortgage please contact us at Gustan Cho Associates by phone or text at 262-716-8151 or text us for faster response. Or by email us at gcho@gustancho.com. Our team of licensed an support personnel works when you work, so feel free to contact us any time.